The house dust mite (HDM) is a cosmopolitan guest in human habitation, it feeds on organic detritus such as flakes of shed human skin and flourish in the stable environment of dwellings. House dust mites are a common cause of asthma and allergic symptoms. The mite's gut contains potent digestive enzymes (notably proteases) that persist in their feces and are major inducers of allergic reactions such as wheezing. The European house dust mite, Dermatophagoides pteronyssinus, and the American house dust mite, Dermatophagoides farinae, are two different species, but are not necessarily confined to Europe or North America. The house dust mite survives in all climates, even at high altitude. House dust mites thrive in the indoor environment provided by homes, specifically in bedrooms and kitchens. Dust mites survive well in mattresses, carpets, furniture and bedding. House dust mites, due to their very small size and translucent bodies, are barely visible to the unaided eye. 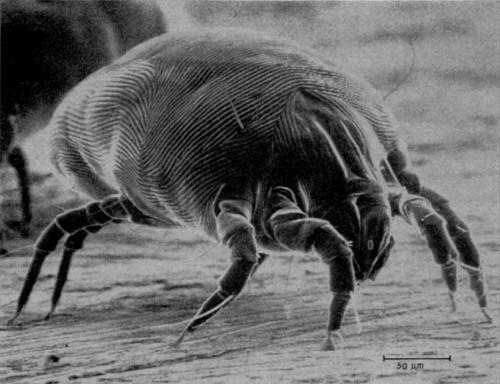 A typical house dust mite measures 0.25-0.3 mm in length. The body of the house dust mite has a striated cuticle. Like all acari, house dust mites have eight legs. To date, we know more than 20 different mite allergens. HDM allergens are named Der (the first three letters of the Dermatophagoides genus), p or f (the first letter of the pteronyssinus or farinae species), and a number representing the order in which they were purified or classified. We can categorize these allergenic proteins into four main families: proteases, proteins displaying affinities for lipids, non proteolytic enzymes,and non enzymatic components. Although the HDM allergens are present in the mite bodies, the main allergenic sources are the mite faeces which can be easily inhaled into the airways and consequently be entered deep into the lungs. Three different PAMPs (microbial pathogen-associated molecular patterns) can be detected routinely in the mite faeces and/or in the mite environment: LPS, Beta-glucan, and chitin. House dust mites are one of the commonest sources of airborne allergens and we can consider that HDM sensitization affects more than 15–20% of the population from industrialized countries. During the last two decades, the prevalence of bronchial asthma has reached epidemic levels in some areas and populations, particularly in children living under highly urbanized conditions. Bronchial asthma is more likely to be found in the urban setting rather than in rural communities due to risk factors associated with modernization and the increased amount of time spent indoors. Sensitization to indoor allergens as a major risk factor for asthma development and severity. Bronchial asthma is a chronic inflammatory disease affecting 300 million individuals worldwide. To pinpoint the cause of allergy symptoms, allergists ask the patient detailed questions about his work and home environments, family medical history, frequency and severity of symptoms, exposure to pets and a variety of other questions. But sometimes the medical history may not suggest any triggers, yet allergy may be the cause. In this case, allergists find out what is the trigger by doing skin tests. Skin tests involve either pricking the skin (Prick tests) or injecting into the skin (intradermal tests) with different allergens and observing for a reaction. A positive reaction (a raised welt with redness around it) may indicate that the patient is allergic to that allergen. Occasionally, allergists may order a blood test in addition to the skin test to confirm the diagnosis of allergy. The blood tests are generally less sensitive than skin testing. The allergy occurs because the immune system of allergy-affected individuals misinterprets mite allergens, usually innocuous substances, as a disease. Recent advances clearly demonstrated that the HDM allergic response can no longer be considered as a unique dys-regulation of the adaptive immune system. Actually, a crosstalk between the innate and adaptive immune system plays a critical role in the initiation and propagation of the allergic Th2 response. HDM allergens break the anatomical barrier of the mucosal membrane and are processed by professional antigen presenting cells (APCs), such as dendritic cells (DCs) or macrophages. APCs mature and present processed allergen peptides to resting naïve T cells in the draining lymph nodes. Activated T cells signal to APCs, particularly DCs, to produce Th2 cytokines, such as IL-3, IL-4, IL-5, and IL-13 (IL-4 is important for allergic sensitization and IgE production; eosinophil survival depends mainly on IL-5; whereas IL-13 has pleiotropic effects in the lungs, including a central role in the tissue remodelling). modulation of the airway smooth muscle contraction. Important is the isotype switching from IgG to IgE, leading to increased production of allergen-specific IgE that eventually binds to high affinity IgE receptors (FCεR1) in mast cells, basophils, and eosinophils. The differentiation of activated naive T cells into functional T-cell subsets (Th1, Th2, Th17, Treg at least) depends largely on the DCs-derived cytokines patterns. Although it is clearly evident that the Th2 polarization requires a source of IL-4 to activate the transcription factors STAT6 and GATA3, DCs were found unable to secrete IL-4. the IL-4 source is from other innate immune cells. Epithelial cells express a large variety of PRRs (pathogen recognition receptors) to respond to microbial pathogen-associated molecular patterns (PAMPs) or to damage-associated molecular patterns (DAMPs) released upon tissue damage, cell death, or cellular stress. Recent studies evidenced that prolonged epithelial PRRs activation by the allergens themselves or by microbial contaminating PAMPs represent one of the key steps in the Th2 cell sensitization process which results in the release of large amounts of proinflammatory cytokines, chemokines, growth factors amplifying the influx of Th2 cells, DCs, eosinophils, basophils, and other inflammatory cells (in particular GM-CSF, IL-25, IL-33). In most children with asthma and atopy, onset of disease occurs early in life, indicating a crucial role of in utero and early childhood environment. A contrasting effect of early endotoxin and mite exposure was observed for mite sensitization: mite exposure increased the risk of mite sensitization at 5 years, whereas endotoxin exposure was inversely associated with mite sensitization. Changes to the airways in asthmatic patients, is a not fully elucidated complex process leading to the irreversible loss of lung function and airway hyperresponsiveness. Airway remodeling includes notably epithelial changes and loss of epithelial integrity, thickening of the basement membrane, mucus-gland and goblet-cell hyperplasia, smooth muscle hyperplasia, and increased airway vascularity. Wall thickening increases the airway narrowing caused by smooth muscle stimulation, thereby promoting bronchospasm and hyperresponsiveness to bronchospastic stimuli. Mucus hypersecretion, epithelial hypertrophy, mucus metaplasia and airway obstruction due to bronchial mucus can contribute to the airway obstruction seen in asthma. The profibrotic cytokine TGF- Beta and Th2 cytokines are some of the main mediators of tissue remodelling. Studies in other systems have demonstrated that a variety of mediators have the ability to regulate fibroblast proliferation and matrix production, including PDGF, IL-1, TNF, IL-5, IGF-1, endothelin-1, tryptases, and leukotrienes. The effects of these agents can be cell- and microenvironment-specific. Figure: Autopsy specimen illustrating inflammation and remodeling responses in the asthmatic airway. a.Airway inflammation and a central mucus plug (asterisk) b.Increased muscle mass (asterisk) and submucosal gland hypertrophy (arrow) c.Subepithelial fibrosis (asterisk) and eosinophilic infiltration (arrow). eye drops containing sodium cromoglicate, nedocromil, or antihistamines to reduce eye inflammation. Newer methods to try to treat house dust mite allergy involve immunotherapy. Allergen immunotherapy (IT) is a proven approach for treating allergic rhinitis and allergic asthma that has been practiced since 1911 and has undergone significant development in the last two decades. As currently practiced, IT involves subcutaneous or sublingual administration of allergens, both methods of which have been extensively investigated. In addition to allergen IT, a number of additional nonspecific IT approaches are being used or are in phase II/phase III clinical trials, which may be available in clinics within the next one to three years. Such therapies include anti-IgE antibodies, soluble IL-4 receptor and new forms of immunotherapy with plasmid DNAs that encode allergens or cytokine adjuvants. Current allergen-specific IT involves administering increasing doses of the causative allergen in order to reduce the clinical signs and symptoms associated with exposure to the allergen and thereby produce tolerance. The allergens are administered by two different routes: parenteral or subcutaneous (SCIT) and sublingual (SLIT), which was introduced relatively recently. This specific immunotherapy alters allergen-specific T cell responses from Th 2-like to Th 1-like and reduces inflammatory cells and mediators in the target nasal mucosa and the airways. For example, immunotherapy with house dust mite extract induces antigen-specific suppressive activity by CD4+ CD25+ T cells in allergic subjects, which causes the regulatory/suppressor T cells to secrete IL-10 and TGF-β. This in turn increases IgG4 and IgA antibody production and suppression of IgE antibodies by B cells, thus mimicking a healthy immune response to environmental allergens. However, currently only 2-3 million people of 55 million with allergic diseases are on SCIT. The main reasons for this are that the target populations dislike injections or cannot afford the time and expense of frequent visits to a doctor's office. There is also a concern about the safety of SCIT and it cannot be used for young children with allergy or asthma. Sublingual immunotherapy (SLIT) consists of placement of an aqueous allergen extract (50% glycerin and 0.4% phenol) in single allergen tablets or capsules under the tongue. It has been extensively practiced in Europe. SLIT induces suppression of allergen-stimulated T cell proliferation and cytokine production. Similar to SCIT, there is also induction of systemic T regulatory cells. In addition, there is evidence for local sublingual mucosal Treg cells, which may inhibit local inflammation. SLIT is considered to have about one-tenth the risk of SCIT. The disadvantages are that SLIT is less effective than SCIT and has not been tested for multiple allergen mixes. There is abundant data in the literature documenting adverse outcomes from allergen immunotherapy. Although very effective in treating allergic airway diseases, IT comes with its own price of local and systemic reactions among which the most severe is anaphylaxis. Anaphylaxis is the most devastating adverse outcome of SCIT immunotherapy and in a prospective study of patients treated in large-in-hospital allergy clinics, 131 anaphylactic reactions occurred among 453 patients receiving 21,022 shots over 10,040 visits. SLIT, on the other hand, has been characterized by a high degree of safety as its most notable feature. Both forms of IT will continue to evolve, for example, by incorporating an increased number of different standardized allergens and by utilizing recombinant allergens. Allergic conditions are complex and it would be naive to think that one form of allergen immunoterapy will suffice for all patients. It is likely that a combination of immunotherapeutic agents with patient-tailored dosages and treatment durations and continued monitoring of immunoparameters will be necessary. In this new decade we should begin to see the fruits of combining basic and translational approaches with interdisciplinary research to develop better ways to treat allergic diseases. ...Meanwhile the best strategy is to reduce the exposure to dust. Large numbers of dust mites can gather in mattresses, bedding, and upholstered furniture. People who are allergic to house dust mites should try to adapt their homes.